Heather and I went out on the Topline with Sea Dragon Charters on Sunday. Boy am I glad we did, the day was amazing! We visited two dive sites off Anvil Island, Dragon's Den and Route 66. Route 66 was on the east side of the island, and was a newly-discovered dive site. Kevin and Jan were both on board today, and reported that the visibility had been great lately. Some dive teams reported being able to see the boat hull from 60 feet. I had my fingers crossed! I can't go farther without first sharing the best octopus encounter we'd had in a long while. I will explain more later on! The day started out cloudy and threatening, but the weather report was correct. It turned into a beautiful day. Here is a picture of the first dive site, Dragon's Den. It was a treat going up to Anvil Island, because it was a bit of a long ride and often the weather and other factors meant it made more sense to go to sites closer to Horseshoe Bay. Not today though! I put together a video compilation of both dives here. The first portion was with my GoPro camera. The rest is using Heather's Panasonic camera with Sola light..
Visibility was indeed excellent. There was a murky surface layer, but under 20 feet it opened up to at least 30 or 40 feet of visibility. There was a great portion of video with bubbles trailing up to the surface. On the Dragon's Den dive, we saw a lot of critters. There was a cute red fur crab inside a cloud sponge (and a squat lobster poking its claws out). The Dragon's Den was so named due to the small caverns that were there. There were three of them, around the 70 to 80 foot depth. They extended back maybe 20 feet, and were more like big rock overhangs. The ceilings were covered will plumose anemones and tunicates and star fish. We discovered our bubbles would knock off the starfish, so a few times it was raining starfish! This photo showed kind of what the roof was like, with a little decorator crab front and center. The plumose anemones around the Dragon's Den site were very pretty as well. Another decorator crab was hiding among them. 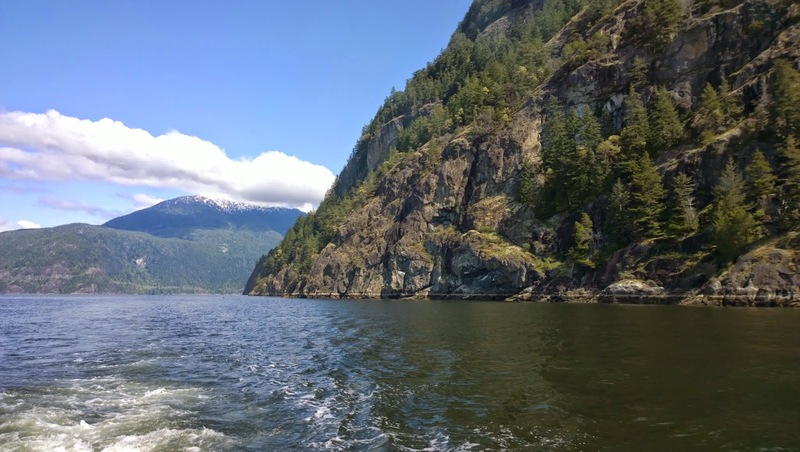 We had a nice relaxing surface interval in the stunning scenery of Howe Sound. I had to take the requisite panoramic shot! For the second dive, it was Route 66 a site no one on the boat had done before. Kevin and Jan reported that when they found it, all the good life was around 60 feet. We couldn't wait to get started! We spent our dive around 30 feet, and it was a good thing because about half way through, Heather spotted a nice sized giant pacific octopus taking a nap on a rock! You could tell it was a giant pacific octopus and not a red octopus because it didn't have paddle-shaped eyelashes under its eyes. The octopus wasn't too thrilled to be disturbed, and put on its threatened display several times (changing its colour to white, and flaring out its mantle). We let him be as much as we could, but we weren't going anywhere until we got a good look! The video at the top of the page turned out really really well. The pictures of the threat display were also awesome. Sadly we had to leave him behind and continue with the dive. The visibility was as good on this dive as the first. 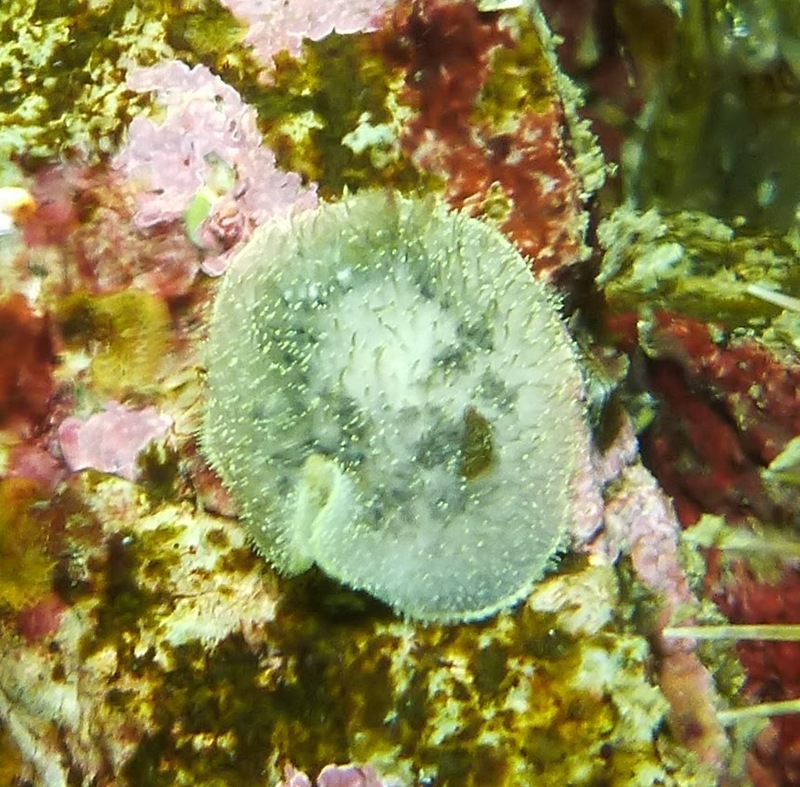 We saw a barnacle eating nudibranch, alone without its usual friends. Decorator crabs were everywhere. Some of them were more decoration than crab! There were a ton of sea squirts covering everything. A small heart crab tried to escape from us by jumping off a rock, but we followed him and he finally sat still for this picture. Coonstripe shrimp were everywhere on this dive. Near the end of the video, you can kind of see them running away from us. 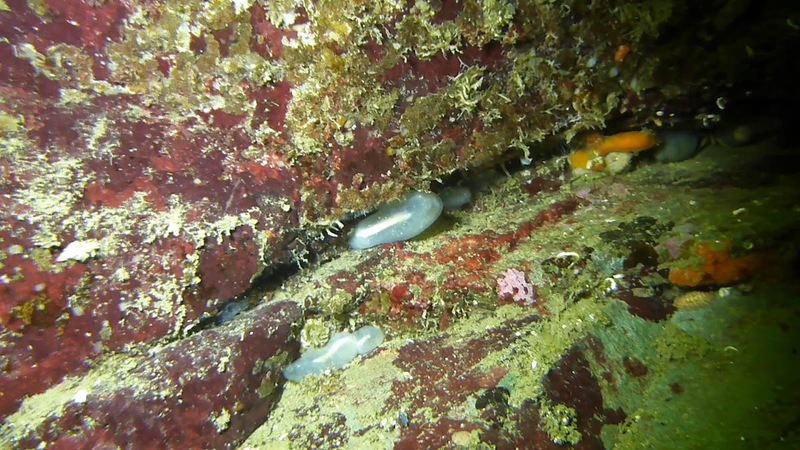 Finally there was some strange tunicate that I had no idea about. It looked like it had something inside of it. The day came to a close far too soon. But we capped it off with snacks and drinks on a patio in Horseshoe bay. Cant' wait for the next time we go out!